Double coated Teflon, performance non-stick. Oven safe to 230 degrees C. Suitable for dishwasher. 5 year guarantee. Our non-stick range is double coated with a non-Stick 4 Star coating which is coil coated to guarantee long lasting performance. Our handled products are designed to make it safe and easy to take tins in and out of the oven even when wearing oven gloves. Made in the UK with a lifetime guarantee. 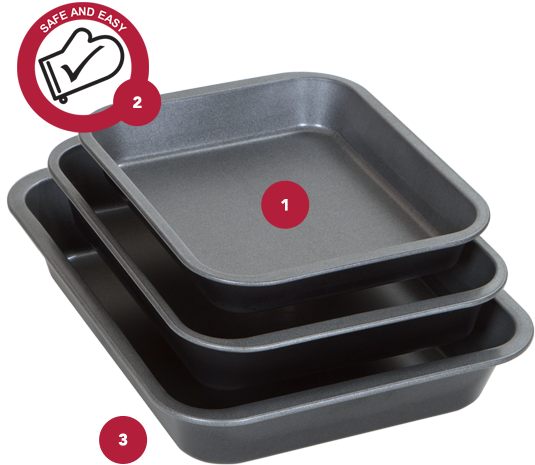 Made in the UK with a Lifetime guarantee the Wham Cook Non-Stick bakeware and ovenware range has a Double coated 4 star performance non-stick and is coil coated to guarantee long lasting performance.